I got the idea for doing a robot collage from Deep Space Sparkle. Look at these adorable robots! This happy robot seems to be doing a little dance. I showed the children some cut out shapes: rectangle, circle, triangle, square, and a trapezoid. 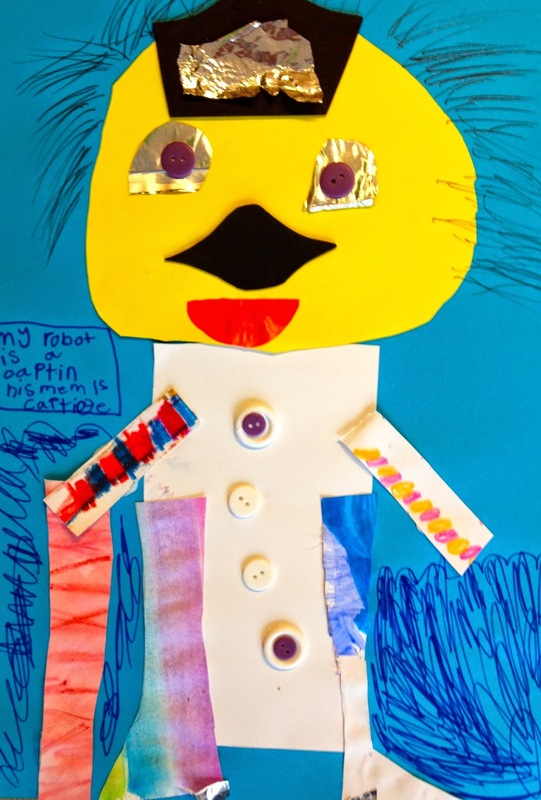 I also showed them a sample robot using lots of colors, and told them to make their robot any way they wanted. "You mean we get to use our imaginations?" Of course the answer was, "Yes!!!!" We put out my collection of metallic papers, which I collect from chocolate boxes, shopping bags, Pepperidge Farm cookie bags, and coffee bags. We also put out lots of buttons, some foam scraps, construction paper and scraps, some painted or colored collage papers, (this is the fate of unclaimed art, I'm afraid,) and a few other odds and ends. 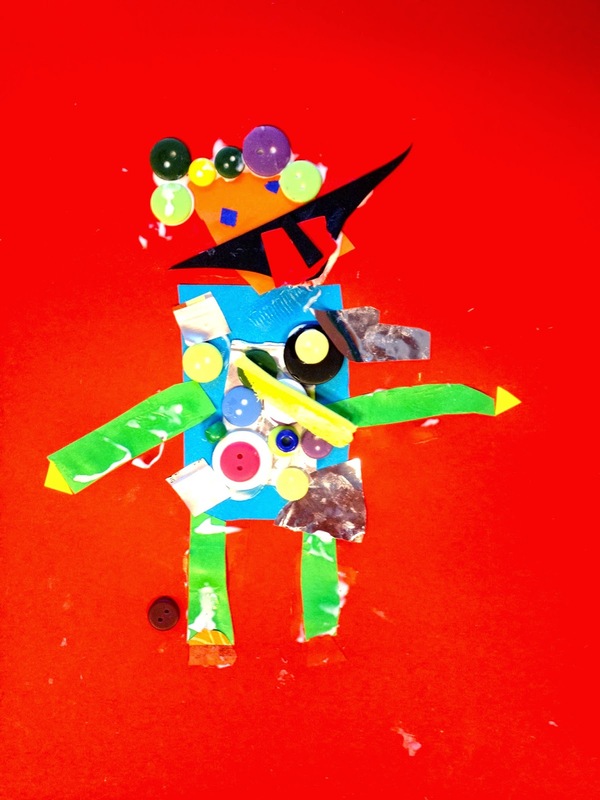 The children are great at discovering the potential of collage materials. I also had a little wooden fig packet which I had brought in to put markers in, and while my back was turned it became part of several robots. I didn't mind; I was amazed at the creativity. I love how brave first and second graders are! 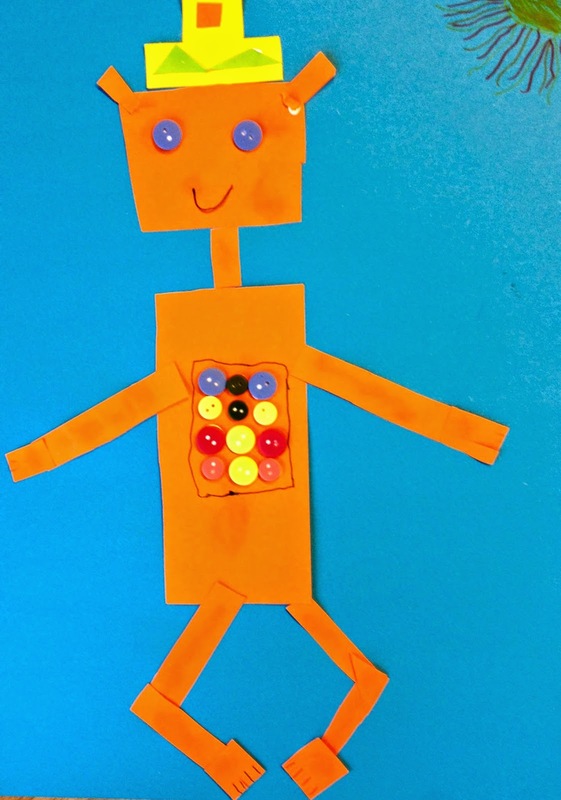 One child said that she didn't know how to make the body. I urged her to try drawing the body with a pen before cutting it out. Off she went...problem solved. 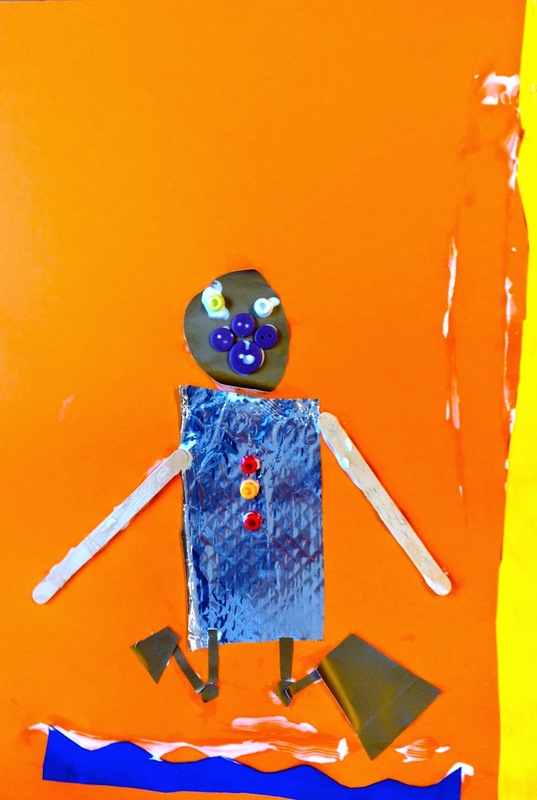 Have a look at these very individual robots! 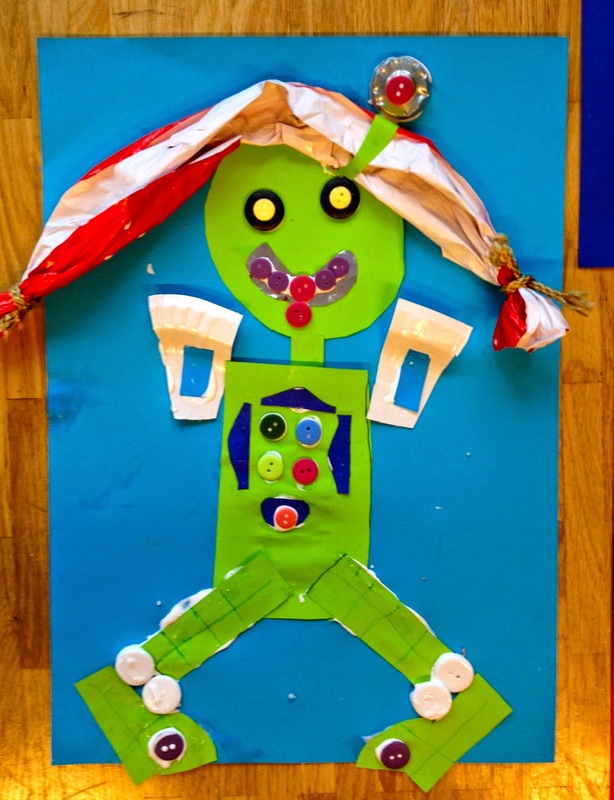 This robot has a folded cardboard head which Ruby, our helper, helped the child create by scoring with scissors. 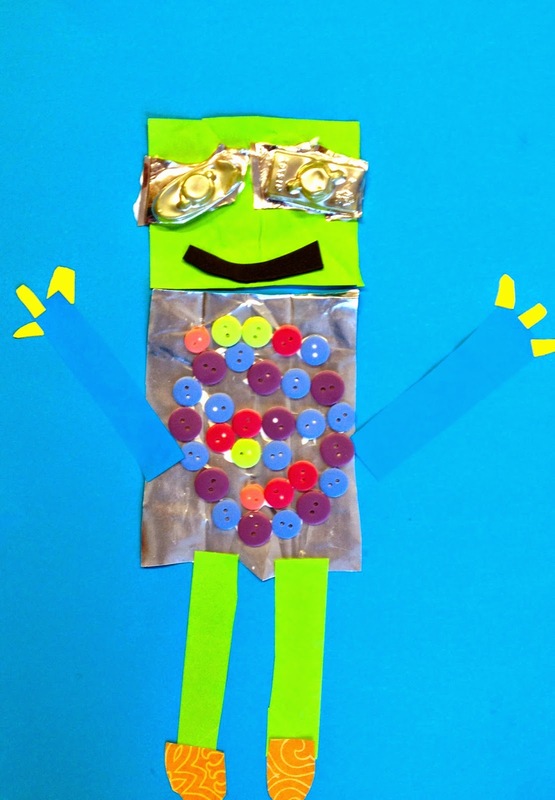 This robot has wonderful golden three dimensional eyes made with a plastic liner from a candy box. 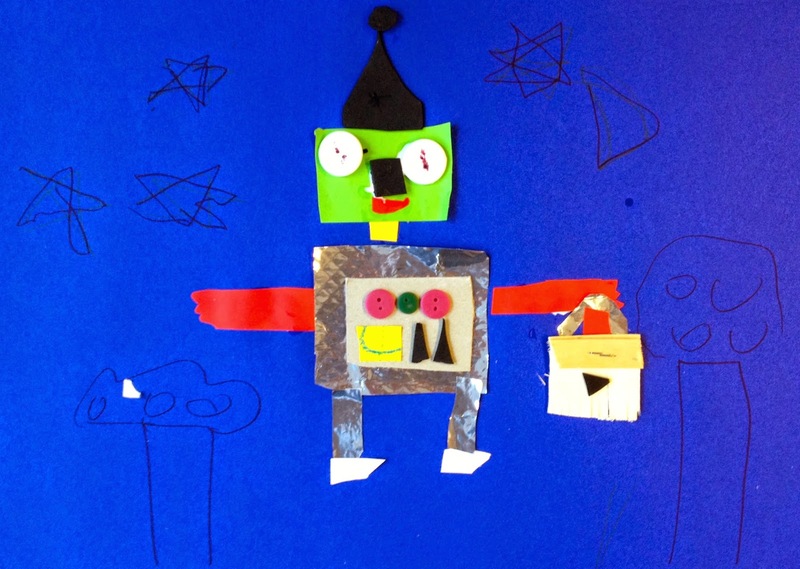 The child who made this robot told me it was a grandpa robot, complete with cane. 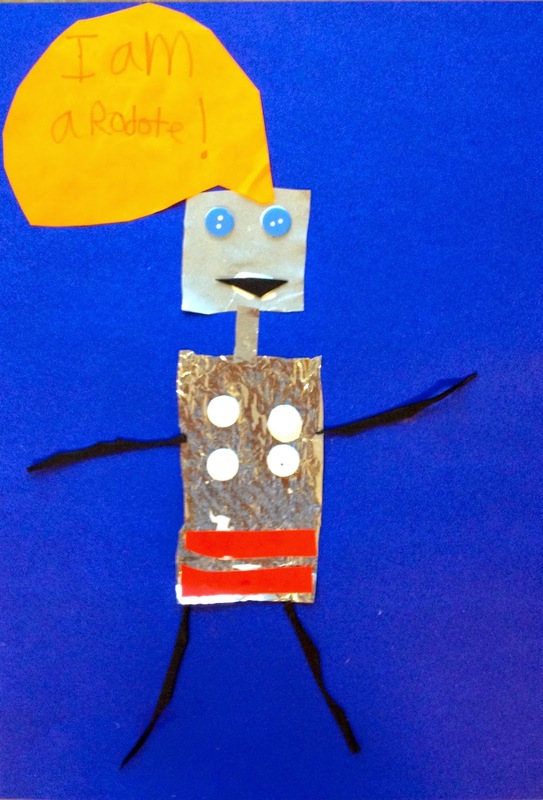 And the child who made this one said her robot was a sea captain. This robot is jumping into a pool from a 300 meter high diving board, the base of which is the yellow line at right. 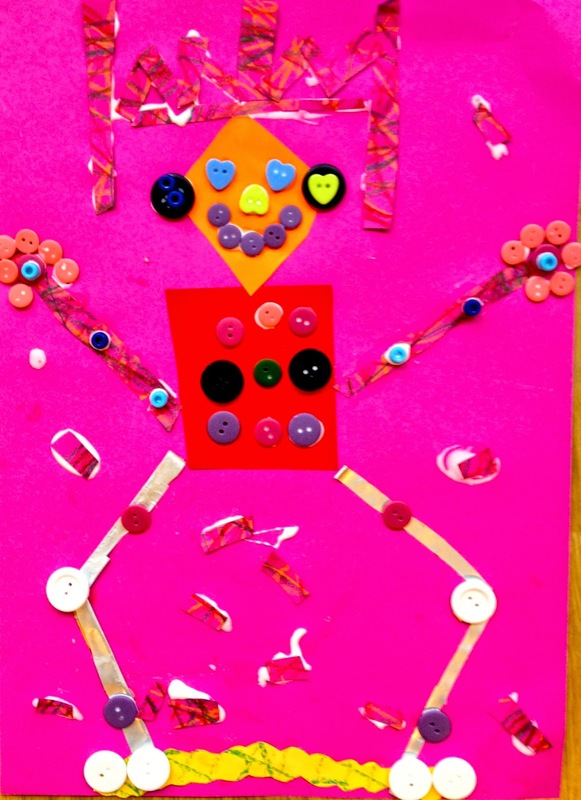 The little girl who created this lively robot spent an enormous amount of time quietly and patiently working on it. She always gets very involved. I think her patience shows! 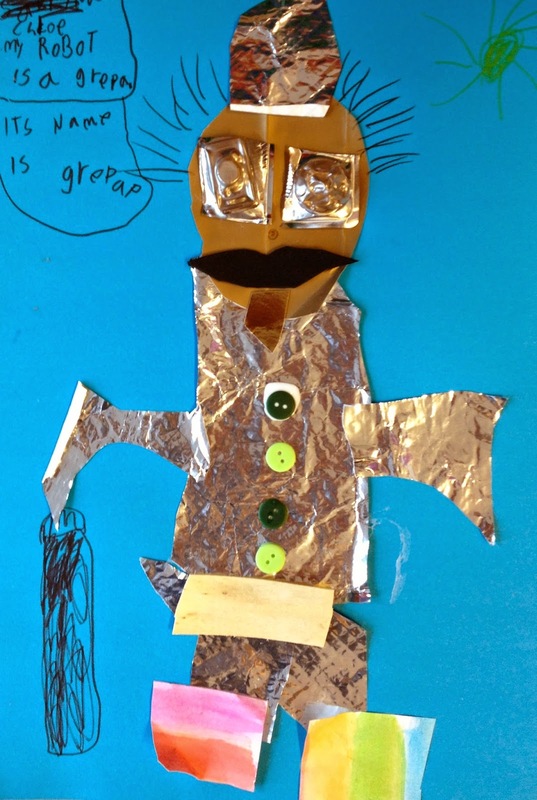 This is a robot elf, the little girl who made it told me. Just in case it isn't clear, a little dialogue bubble lets you know that this is a robot, and a wonderfully graphic robot it is! This robot is sticking his tongue out! 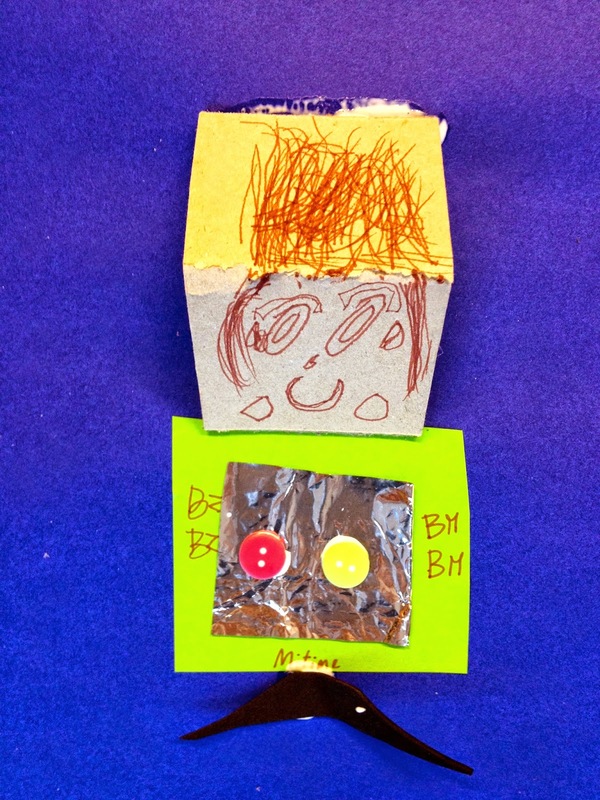 Look how the girl who made this robot used a red and gold shopping bag, twisted up, to make hair in ponytails, decorated by a candy box liner barrette!